Our program includes: Jiu Jitsu, Judo, Wrestling, Conditioning and Muay Thai classes. Call for a FREE trial class and receive the best training in NYC. 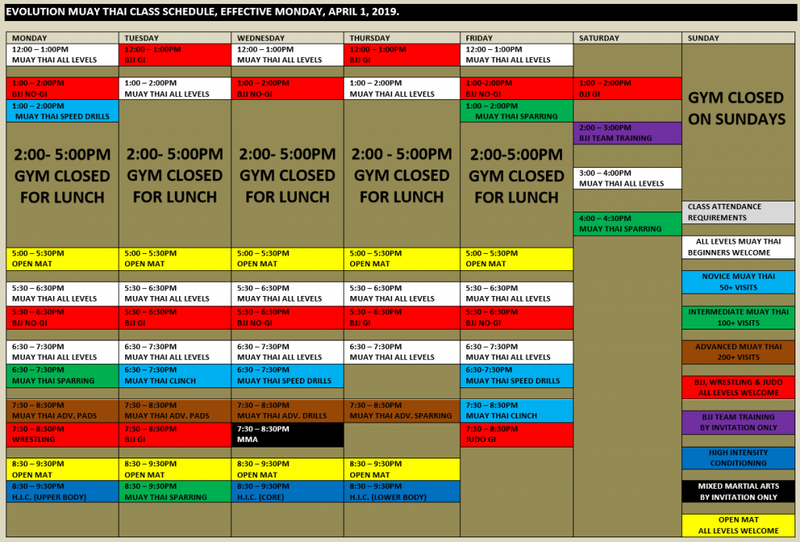 For better viewing please click on class schedule to expand image. PDF version available. Workout in a fun atmosphere where you’ll be encouraged to push yourself to your limit and to never give up. Surrounded by individuals who are looking to get into shape, teammates who are competing, and everyone is working together to take their training to the next level as a team. Muay Thai classes are the perfect way to lose a few pounds, while learning self defense and having fun in the process. Stepping into a Muay Thai gym can be a little intimidating, but here at Evolution Muay Thai, we do our best to make you feel at home by cracking a few jokes, keeping things lighthearted and generally doing our best to make your training experience as fun as possible. Call us at 646-649-3976 for current pricing options, or to book a free trial. Trial lessons are by appointment only and offered to NYC or New Jersey residents. Please note Muay Thai classes (All Levels) listed in white and Grappling classes listed in red are the only classes offered as part of the free trial. * Those who are attending class for the first time, please arrive at least 15 minutes early for registration. * Identification will be required upon registration. * Minors under 18 years old must be accompanied by parent or guardian. * We are a barefoot gym. Shoes and socks are required to be taken off at the front desk. * No personal possessions allowed on the mats. Lockers are available. Please bring your own lock. Private classes are also available whenever group classes are not in session. Prices vary depending on the instructor. If interested in scheduling a private class please email us at info@EvolutionMuayThai.com .